Two Sundays this Summer our schedule will be different. 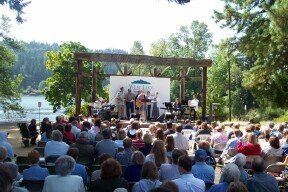 On July 23rd, New Life Church will hold a service during the West Linn Old Time Fair at 10:00 at Willamette Park. Then, two weeks later, August 6th, we will return to Willamette Park (map) and enjoy our annual outdoor service and picnic. Put these dates on your calendar now and be thinking now about who you might bring with you.